Branded FuseOhm, is self-powered data-logger that offers real-time measurement and recording of current (1A – 1,000A), voltage, phase angle and local temperature. Power dissipation is <6W. Sensing is resistive, and based on the firm’s existing ‘Triple Ohm’ intellectual property. Data can be logged for a year, and is extracted via a display or micro-SD card, or optionally: Ethernet or radio link. The intention is that ‘distribution network operating companies’ (DNOs) can install it to continuously-monitor secondary electrical distribution substations and to help reduce asset maintenance. In the photo, the FuseOhms are the orange parts (two fitted), installed by removing a fuse, installing the FuseOhm, then re-installing the fuse onto the FuseOhm. “The adaptors slot into existing fuse-ways in a few seconds so that a complete monitoring system can be fully installed within a typical substation comprising a dozen or so fuses within minutes,” claimed the firm. 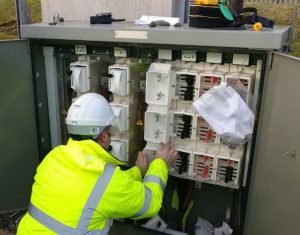 The University of Strathclyde’s Glasgow-based Power Networks Demonstration Centre (PNDC) has tested pre-production prototypes and, claims 42, showed FuseOhm was robust to fault conditions as well as remaining accurate over temperature and other environmental conditions. Two grants were received from Innovate UK to help with the development of FuseOhm: a Phase One award which was announced in November 2016 to help fund the consultancy’s initial work on developing the business case; then a second grant within six months to enable further system development, field trials and commercialisation.